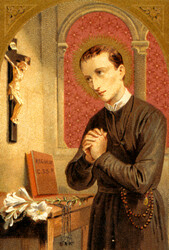 Saint Gerard Majella is known as a Thaumaturge, a Saint who works miracles not just occasionally, but as a matter of course. It has been said that God raises up not more than one every century. He was born in Italy at Muro Lucano, south of Naples, in 1726. As a child of five, when he would go to pray before a statue of the Virgin with her Child, the Infant Jesus regularly descended to give him a little white bun. He took it home and naively told his mother, when she asked him, where he obtained it. His sister was sent to the church to observe in secret, and saw the miracle for herself. He wanted very much to receive Holy Communion at the age of seven and went to the Communion railing one day with the others; but the priest, seeing his age, passed him up; and he went back to his place in tears. The following night, Saint Michael the Archangel brought him the Communion he so much desired. As he grew older, when anyone spoke to him about marriage, he would answer: The Madonna has ravished my heart, and I have made Her a present of it. He desired to enter religion, but his health was unstable as a result of the mortifications he had constantly practiced as a young man. He had acquired a reputation of sanctity, and finally, when he was 23 years old, he obtained the aid of some missionaries to second his request, and was admitted as a Coadjutor of the newly founded Congregation of Redemptorists, in 1749. He showed himself to be a model of every virtue and he did the work of four, still finding time to take on himself that of others. He would say: Let me do it, I am younger, take a rest. He made the heroic vow of always choosing what appeared to him most perfect. He was perfectly obedient to his superior's wishes, even when not expressed; and one day, to demonstrate this to a visiting authority who required a proof, his immediate Superior sent him out, saying: I will tell him interiorly to return; he needs no other command than this. Soon the Brother knocked on the door once more and said: You sent for me to come back? He conducted a group of students on a nine-day pilgrimage to Mount Gargano, where the Archangel Michael had appeared. They had very little money for the trip, and when they arrived at the site, there was none left. Gerard went before the tabernacle and told Our Lord that it was His responsibility to take care of the little group. He had been observed in the church by a religious, who invited the Saint and his companions to lodge in his residence. When the party was ready to start home again, Gerard prayed once more, and immediately someone appeared and gave him a roll of bills. The most famous of Saint Gerard's miracles occurred when a mason fell from a scaffolding during the construction of a building. Gerard had been forbidden by his Superior to work any more miracles without permission. He stopped the man in mid-air, telling him to wait until he had obtained permission to save him. He received it, and the man descended gently to the ground. When a plague broke out, he had the gift of bilocation; he was seen in more than one house at the same time, assisting the sick. Not a page of his life, it is said, was without prodigies, all tending to the glory of God and motivated by prodigious charity towards his neighbor. He was condemned falsely at one time, as a result of a connivance between two individuals; the Superior General, Saint Alphonsus Liguori himself, who did not know Gerard personally, was induced to believe the black calumny. Later the guilty ones wrote him a letter confessing their fault, and Gerard, who had said nothing at all when relegated into solitude, was asked why he had not said he was innocent. He replied that the Rule required that the religious not defend themselves. He died in 1755 at the age of 29 years, was beatified in 1893 by Pope Leo XIII and canonized in 1904 by Saint Pius X. They who belong to Christ have crucified their flesh with its passions and desires.